Happy 2nd Anniversary! Wow! I can't believe how fast time flies when your having FUN! We have had some crazy, exciting adventures the last two years! We definitely have had some struggles with being super crazy with work, school, clinicals, my studying for board exams, and trying to find time to date each other, but through this we have become so much closer! 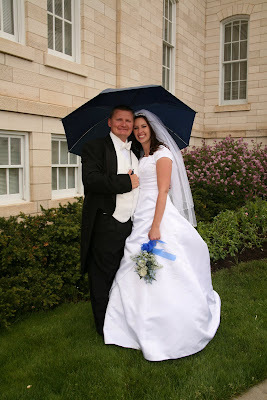 I can honestly say I love you (Ryan) more today, then 2 years ago on that crazy rainy day we were married! Happy Anniversary to the most AMAZING guy! I LOVE YOU! and look forward to many more adventures with you! Today was the day! I had finally set a day... still didn't feel ready, but at the same time not sure if more studying would really help. I got up early to get ready to go take a test while Ryan was getting ready to run a 5K. It was nice to have the testing center just down the street. About half-way through the test I realized that I really didn't know a lot of stuff. As I ended the test, I knew that I had not passed and was planning on when to take my test again. I headed out to the main desk to get my score... and I PASSED!!! Yipee! I am officially a registered Sonographer! We woke up early to get ready and headed down to Provo Tabernacle where the race was to begin. It was a nice over cast day, and started to get a little chilly. 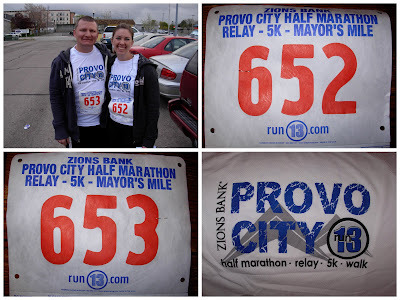 We ran into my friend Tavia in the parking lot who was there to cheer on her husband who was running the half-marathon. She took a couple of pictures for us (thanks!). We headed over to the starting line and waited for the half-marathoners to start, next came the 5K. We lined up and started the race, about a block into the race it started to rain. Then a little while later the rain turned to slush/snow. It wasn't to cold since we were running and able to keep warm. Just a little annoying dripping down your face. We had a great race and made it in under 35 minutes. Which for me is fabulous! Ryan was wonderful and ran with me the whole time. He was great at keeping a nice steady pace. 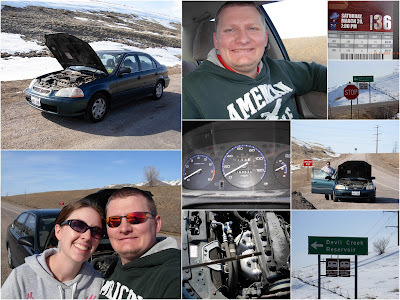 As we finished and headed back to our car... we realized that our car had been towed. We had parked in a parking lot near the tabernacle and there weren't any signs in front of the space we parked in. And we figured it was Saturday and the business was closed, we should be fine for an hour or so. Unfortunately we were wrong :( our wallets and cell phones were in the car, so we decided to walk over to the hospital to call. We had made it about half way when we saw some of the half-marathoners and decided to hang out and cheer them on. We were there about 10-15 minutes and saw a few friends. We then headed up state street. We had figured we were fairly close to the towing company by the time we reached the hospital so we would just walk over. 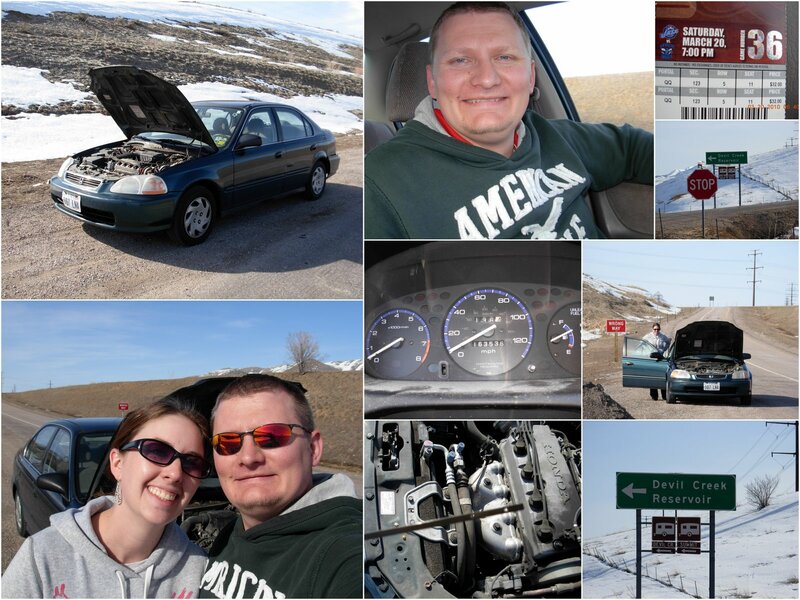 We had to back track a little bit to find the front entrance, but were able to get the car back for a small fee. What an expensive lesson! By the time we had gotten home and stopping in the cold without much of a cool down and stretch we were pretty sore and tired. We had a great day, but glad to be home to rest and recoup. Next, the thing that has kept me busy.... I have been working PRN (as needed/on-call) for Heber Valley Hospital. They are a small hospital and not super busy, because of this they only have one Ultrasound Tech there a day. This has given me some experience, but mostly something to put on a resume. The first part of April, Dixie, our main Ultrasound tech called and asked if I could cover her shifts and call for the next 6 weeks because she was having emergent carpal tunnel surgery (she had waited so long they weren't sure how much damage was done to the nerves and wanted to do the surgery that week). So from the first part of April till almost the end of May I have been working full-time and taking a ton of call (every other week, and every other weekend, plus all my regular Mondays). And during this same time Ryan has been very busy. He has been working full-time and going to school full-time. Ryan has been taking classes at UVU working on a biology degree, and to cut out a semester of school he decided to take a couple of classes at BYU. Unfortunately the two semesters overlapped by about a week. So during finals at UVU he was starting his first week at BYU. We have had a busy crazy year so far... and I (amanda) decided we needed a little break. 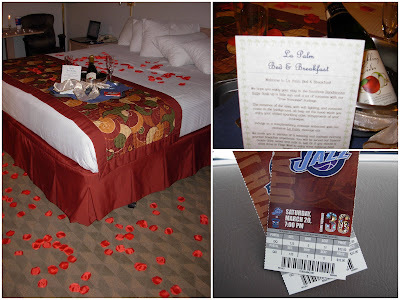 I found an awesome deal on a hotel room and with some ideas from one of my new favorite websites (here) put together a fun little Bed and Breakfast. Friday was a CRAZY day for me! As I was leaving work up at Heber hospital Wednesday I received a phone call to come in for an Ultrasound job interview on Friday. SO amidst the craziness I already felt... I was also planning this getaway that Ryan didn't know about (about this time he may have had a small clue we were doing something) I had a job interview that I was super nervous for. As soon as Ryan left for work I crazily ran around the house pulling out my props (fancy sparkling apple cider, fancy glasses, fun rose petals) and hurriedly pack our things for the weekend. I was able to meet Ryan for lunch (which I always love) and then headed to my interview. I was so nervous! I think in part because 1. I hate to get up in front of people, and 2. I would be scanning in front of my clinical instructor (he's not scary, I just wanted to show him that I did learn something. I walked out of the interview feeling good. I may not get the job but it was a good learning experience for me. I still have a ton to learn but at least I didn't fall totally on my face. La Palm Bed & Breakfast! I returned home trying not to look to suspicious(which I am sure I did). 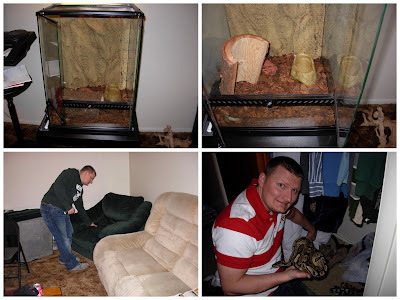 We ran to the pet store to get Eve (our ball python) some dinner. Which for some reason she didn't want. Silly Snake! Then off to dinner at China Light in American Fork. This is one of our favorite places to eat Chinese. After this we headed to Grandpa and Grandma VanLeuven's for some cake and ice cream. Happy 89th Birthday to Grandpa! Then off we go! We did have to stop by the house for something (maybe Ryan's book?) and as we were leaving (i was trying to drive) Ryan had the doors locked, and opened the passenger door for me and then he jumped across to the drivers seat (apparently he knows me to well... this was my idea to!) So after a small struggle, I won (or he let me win) and we blind folded and handcuffed Ryan, my plan was for him to not know where we were going. I made Ryan keep his eyes closed as I guided him to our room (which by this time I had lost him), and this is what he saw when we walked in! I didn't have anything planned for us during the day... It was up to Ryan what he would like to do. We decided to take a drive up I15 to Downey ID to Flags West truck stop for lunch (they have yummy hash browns and bacon). On our way back to SLC our car started to make some noise (never good). So we pulled over to see what is was, and figured it was out of oil. I know better... I was raised better... but none the less I had gotten lazy and forgot to check the oil before a long drive. So on the side of the road in ID about 10 miles out of Downey, and about 7 miles from the next town... we decided to try and limp into the next town (again I know better, you stop before you ruin things). We'll we made it another mile or so and the car died. Luckily just at the next exist of Devil Creek Reservoir, we coasted down the exit and out of the way. Hmm... what to do now? We called Ryan's mom to see what there fun Saturday afternoon plans were and to see if they could come rescue us. They didn't have anything going on, and Ryan's dad was trying to find a trailer. While we waited we played catch (we always have a mitt and ball) and talked. A nice couple pulled off the side of the road and asked us if we needed anything... at this point we were hoping (really hoping!) that a couple quarts of oil would solve our problem. They were nice and ran into the next town and found some (expensive) oil. Which we appreciate! Unfortunately it didn't help. The car made worse sounds, and started to shake so much the whole car was shaking. So we played catch some more, then when the sun started to go down we climbed back into the car and chatted. It was fun to have this time to spend together! Even though we were going to miss the basket ball game, and that our car was going to the graveyard... we enjoyed our time together! I think it was just after 7pm that we saw the most awesome sight! A beautiful black truck with a trailer had come to rescue us! THANK YOU!!! THANK YOU!!!!! I should have taken a picture of us loading the car... it was a little comical (or I thought so). We had Par pull the truck just down the road a little and Ryan, KayLynn and I pushed the car until it came to a little down hill and Ryan took over the steering and coasted the car up onto the trailer. we came home too THIS.... Eve had gotten out! I believe that it was when we were trying to feed her, that her cage was closed but never locked. So off we went...tearing the house apart looking for a silly snake. We lifted up cushions, behind the stove, dryer, couches, and finally found her in our bedroom closet! Wow! What a weekend! After putting Eve back in her cage, and locking it. We headed back up to SLC in the truck. We still had one more night at the hotel... and all of our stuff was still there. All in all... It was a great (and EXCITING) weekend! Even though it didn't turn out the way I had planned (yes, i'm a planner) it was GREAT! We were able to spend some time together and that is what counts! Sorry for the novel.... I am not very good at journaling, so I am using this blog as my journal. Hope you enjoy our exciting Adventure! Our Grandpa VanLeuven turned 89 this year! For his birthday we took them out to one of our favorite places to eat, Skippers! We enjoyed the yummy clam chowder and fish! I think we took about 4 or 5 pictures and for some reason (ryan's funny faces, and grandpa leaning out of picture, my face being cut out) this is the best one. We had a very crazy week! Between work, Ryan's school, and my studying we didn't get to see much of each other. This is what I found when I left work on Wednesday. It was fun to walk out of work and see these bright PINK Love Notes all over my car! Thanks Ryan for making me feel so LOVED and SPECIAL! I am so LUCKY to be married to such a wonderful man! LOVES! Random books from Amanda's bookshelf!